Poor old Bobby. His bonce is all over the place. So many family issues. So much emotion from the passing of Amber. When five grandchildren took over Laurel Cottage last weekend, Bobby slunk off to the the room at the bottom of the garden. Soon to be featured in “Room at the Top”. It has all you need. Heated radiator. Fold down bed. 1970s HiFi system. Records, tapes, CDs. Cobwebs and junk. The garden has an outside toilet. None the less there were a few little “tensions”. The occasion was to take Amber’s three nieces to her flat in North London by car. There they would find boxes for each from her and an invitation to look at what else might be desirable. For a very sophisticated, stylish lady this was an irresistible invitation to her nieces. But a crowded car driven by Bobby right through London and back even more crowded was quite a challenge. It was also Remembrance Sunday. Something observed with great respect by Diddley and Bobby. To Bobby’s eternal regret he forgot to tell them the big reason why Diddley was so keen on respectful observance. Private Evan Davies. Fast forward to Tuesday and the first time Bobby had been back in Diddley’s bedroom post grandchildren. This picture was lying on the bedside table. Taken from drawers full of memorabilia. How did this one picture appear almost by divine intervention? He doubts the children know about him. Died 21 September 1916 Aged 20. He was Diddley’s great Uncle. She was unaware of his existence until recent years and then made sure she found out all she could. Bobby shared her interest in her forebear. Private Evan Davies came from the Yorkshire side of Diddley’s family. Born in Middlesbrough, where her family still live. He joined the Kings Own Yorkshire Light Infantry. Was sent to France and was killed at just 20 years old. On the Somme. With tens of thousands of other young men. 21 September 1916. From the gravestone it was a simple job to search the war graves commission website and find details of where he is buried. Diddley was intent on going there. Sadly she never made it, but it’s our hope from this story that one of his great, great grandchildren will make that journey to France. Maybe with me and Bobby and ensure that his memory will never be forgotten. 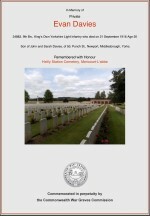 Confirmation of grave location from the Commonwealth War Graves Commission Website. Details on Heilly Station Cemetery, Mericourt-Labbe. You will see that there are New Zealand references on the gravestone. So many young men were killed that they were buried two by two. Private Evan Davies shares his with a New Zealand soldier, whose name is obscured by the wreath. A poignant reminder that this was a World War! And to complete this story of remembrance, Bobby went back to Christ Church Spitalfields a week after the funeral and lit candles for Diddley, Amber and Private Evan Davies. There is no doubt that, whilst we remember all wars and casualties, the vast majority of War Memorials throughout the land have their origin in the Great War. Such as here in Dorking. Our home town. Lest We Forget. Dorking Chamber of Commerce. In Memory of Dorking Men who Fell in The Great War. ← A Great Success (Over GAD).